Want to Make an Impact With Your Business? Get on TV. There are thousands of ways you can get publicity for your website online. There is search marketing, social media, blogging and a host of other publicity methods. Getting a site to “number one” on Google is a dream for many businesses who spend hour after hour and pound after pound trying to beat the competition – and the system. Meanwhile, other businesses seem to succeed without ever being number one on Google. Even Google itself is not the “number one” for the phrase “search engine“. Google appears 20th in the list, at the bottom of page 2, well below “DuckDuckGo”, “Yahoo!” or even “Bing”. Yet in spite of this, Google doesn’t appear to be doing that badly. It is not number one for its central business, yet beats the others hands down. Perhaps being number one on Google is not all it is cracked up to be? However, the word “Google” exists in the “real world”. How many times today will someone say to you “Google it”? How many times will you see the word Google in print, hear it on the radio or TV? How many times will you even think of Google? Yet, in contrast, how many times today will someone say to you “Bing it” or “DuckDuckGo it”? How many times will such phrases be seen in traditional media? It isn’t ranking in the search engine that appears to count for much. Instead it is ranking in the real world. This has been thrown into the spotlight now that new research has shown how much time we engage with the Internet compared with other electronic media. 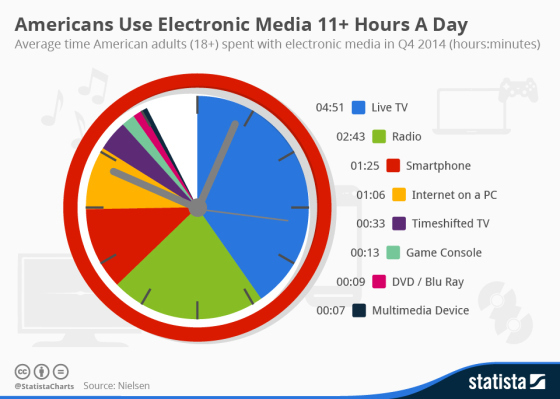 According to Nielsen, Americans spend 11 hours a day using electronic media. But almost two thirds of that time is spent with traditional electronic media – TV and Radio. Only just over an hour a day – on average – is spent on using the Internet on a PC, with a further hour and a half spent on mobiles. What this really shows us is the fact that in spite of all the new media we are surrounded by, old-fashioned media still plays a central role in our lives. It also means that if you want to get notice you need to be in those traditional media – getting your business on TV and on the Radio is important if you want to be noticed, because that is where most of your audience spends most of its time. Hang on a minute…where does Google get mentioned a lot? Oh yes…on Radio on TV….and not in its own search engine. There is a lesson there for all of us in business. This article was syndicated from Business 2 Community: Want to Make an Impact With Your Business? Get on TV.